Researchers report that resveratrol (rez/vair-ah-trol), known as a red wine molecule, helps to reverse what are called somatic cells (cells that have already been converted into muscle, heart, brain, etc. cells) back into being stem cells better than five other molecules tested for such capability. These converted stem cells can then be harvested for insertion into living tissues to replace damaged or aged cells. This discovery is published in an early online edition of the journal Aging Cell. Such a maneuver, to reverse already developed cells, had already been demonstrated by researchers in Japan about five years ago. But this approach is fraught with drawbacks, namely that viruses used to insert reprogramming factors into cells can induce gene mutations and activate genes that promote cancer. So-called reverse induced pluripotent stem cells have remained a research tool rather than a therapeutic technology. Researchers have been searching for the next big milestone in making stem cells without viruses, which set the stage for resveratrol. Researchers took mouse cells that had already had cell controlling factors inserted with viruses and then tested two drugs (rapamycin, metformin) along with three natural molecules (resveratrol fisetin, curcumin)for their ability to reverse developed cells into what are called pluripotent stem cells. The term pluripotent refers to a stem cell’s ability to convert (differentiate) into cells in more than one tissue or organ. Rapamycin, an immune-suppressant drug, was the primary molecule being tested, as it is known to prolong life in laboratory studies. Researchers were surprised to find resveratrol out-performed rapamycin. Many chemicals that enhance cell reprogramming in mice also have similar positive effects on human cell reprogramming, so these findings may also be applicable to human cells, say researchers. © 2011 Bill Sardi, ResveratrolNews.com Not for posting on other websites. Rapamycin and other longevity-promoting compounds enhance the generation of mouse induced pluripotent stem cells. Reprogramming of somatic cells to a pluripotent state was first accomplished using retroviral vectors for transient expression of pluripotency-associated This seminal work was followed by numerous studies transcription factors. reporting alternative (non-insertional) reprogramming methods, and various These studies have conditions to improve the efficiency of reprogramming. contributed little to an understanding of global mechanisms underlying Here we report that inhibition of the mTOR (mammalian reprogramming efficiency. target of rapamycin) pathway by rapamycin or PP242 enhances the efficiency of Inhibition of the reprogramming to induced pluripotent stem cells (iPSCs). insulin/IGF-1 signaling pathway, which like mTOR is involved in control of In addition the small longevity, also enhances reprogramming efficiency. molecules used to inhibit these pathways also significantly improved longevity We further tested the potential effects of six other in Drosophila melanogaster. longevity-promoting compounds on iPSC induction, including two sirtuin activators (resveratrol and fisetin), an autophagy inducer (spermidine), a PI3K (phosphoinositide 3-kinase) inhibitor (LY294002), an antioxidant (curcumin) and an AMPK (activating adenosine monophosphate-activated protein kinase) activator (metformin). 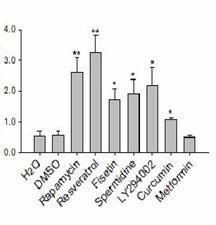 With the exception of metformin, all of these chemicals promoted somatic cell reprogramming, though to different extents. Our results show that the controllers of somatic cell reprogramming and organismal lifespan share some common regulatory pathways, which suggests a new approach for studying aging and longevity on the basis of the regulation of cellular reprogramming.